Those who work at multiple locations, or have more than one PCs, or have an external drive and need to maintain and synchronize files or a folder for backup or file security purposes, know how frustrating and difficult it is to do manual backups and keep files and folders synchronized. FolderMatch is an effective software application that can help to keep files and folders organized on a desktop computer, perform backups to removable disks, synchronize rapidly changing laptop data with your main computer, or perform network file maintenance. This tool is great if you need to update backups on regular basis to safeguard your precious files against system and hardware failures. The download size is small (~5MB) and the installation process is quick and straightforward. The interface is pretty simple and the main GUI shows two windows for folder comparison. It allows you to select the folders or files to compare by using the file browser. After selecting the two folders you can press the compare button to view the comparison with all the details. 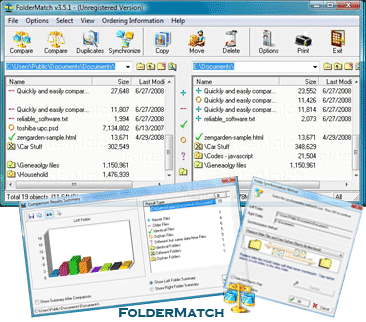 For synchronization, FolderMatch provides many methods which can be selected to suit your needs. These include make left folder same as right folder or vice versa, can replace older files and copy orphan objects (bi-directional), move the contents from one folder to the other, or define a custom synchronization method. Moreover, this tool lets you compare to folders by their size, date and time, attributes, version, binary contents, MD5 or SHA-1 signature, along with the file differences. One-button synchronization solution makes it easy and reliable to backup photos, emails, contacts, and documents, it also enables the users to compare and synchronize two folders, two drives, or two computers. You can find out the exact text differences between two text files, Excel spreadsheets, Microsoft Word, Adobe PDF, or Rich Text (RTF) documents. It lets you find an replace duplicate files from your PC even if the files are there with different names. It uses advanced file comparison methods to detect duplicate files and help you save a lot of space on your hard disk drive. It lets you synchronize the system clock with the ones from online servers. It has a good response time and performs synchronizations quickly. It also uses very low amount of CPU and system memory and so it does not lag the system at all. Drag and drop is not supported, so you have to use the file browser to select files or folders. Drag and drop will allow more ease of use for the users. Although the UI is well arranged and works well but it still lacks a lot in the visual department. The software actually looks very old and outdated. FolderMatch is a lightweight yet powerful enough to compare and synchronize files and folders, remove duplicates to free up storage space and create backups of your data. The software is easy to use and is suitable for all types of users even novices. It is a perfect solution for you if you are looking for one-click backup solution. This tool is definitely worth trying.